Don’t be fooled; them’s cheese grits buns! Slide me right on down to this recipe! That “aha!” thing transpired for me just the other day when, like a ton of bricks, I thought, “Breakfast sliders!! Made with breakfast sausage, and grits for buns!” Well, technically, it was grits buns or potato pancake buns, but for some reason regular old biscuits never even occurred to me until I pinterested breakfast sliders just to make sure they weren’t already all the rage. I guess for me a biscuit bun makes it too sandwichy; too close to something thrown out of a drive through window like a hockey puck aimed right for your pie hole. Plus, in case you haven’t noticed, we don’t really do “normal” in Laura’s wild kitchen. I did end up making both grits buns and potato pancake buns, and while both were good the grits buns won for two reasons: while they don’t take anymore time, they are seriously easier to make, and when you broil or pan sear the grits, the cheese kind of oozes out a little and takes on this “fried cheese” quality that really can’t be surpassed. If, for whatever reason, you’d like to try it with the potatoes, just omit the meat from my potato pancake recipe and cook on. 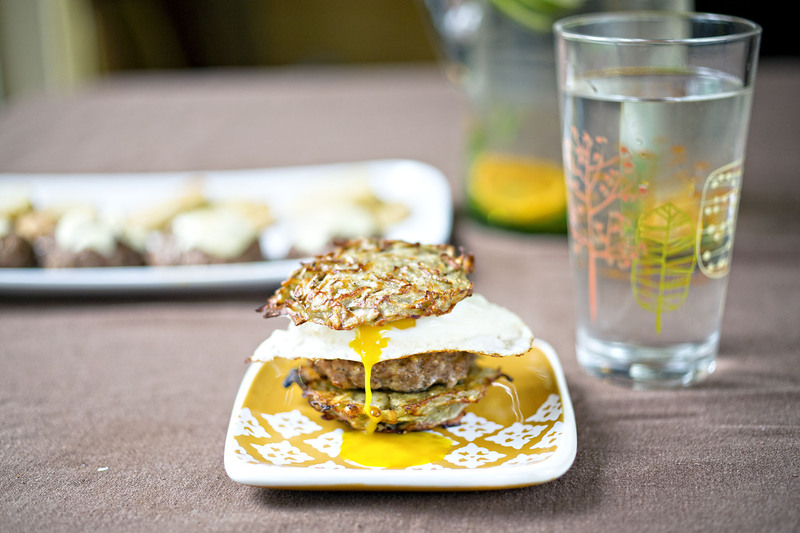 The potato pancake slider. Just look at that gooey yolk! The main thing to keep in mind with this recipe is that the grits need to cool to set up. Twice. First when you put them in the muffin tins, and then after you broil them so they are firm when you eat them and cool enough to handle. I chose to do both the sausage patties and the grits buns in the oven because all that pan searing and flipping gave me nightmares about being chained to the stove by one of those cartoon sized iron ankle clasps. However, if you’re slick with a pan and don’t mind having multiple skillets going (for the sausage patties and/or the grits buns and/or the eggs) then by all means go for it. Also, when it comes to forming the patties, the flatter the better. Especially if you have children (or adults) with tiny mouths that don’t eat a tall sandwich very well. Boil 3 3/4 cups of water and add the grits. Cook and stir with a whisk (to prevent lumps) for about 4-5 minutes, until mixture thickens. Add a little salt and pepper to taste and the chives and cheese and continue to stir until incorporated and the cheese is melted. Pour the grits into a muffin tin and cool in the refrigerator until set, about 15 minutes. Once set, slice the muffins in half and transfer to a foil-lined baking sheet sprayed with pan spray. Spray the tops of the grits with more pan spray or drizzle with olive oil. Broil in the oven at 500 until they are golden and start to crisp, about 10 minutes. Set aside until they are cool to the touch. Preheat the oven to 450. Add the maple syrup to the breakfast sausage. Form into small patties (no larger than a hockey puck) and transfer to a foil-lined baking sheet. Bake until cooked through, about 10-15 minutes. Top with cheese slices and put back in the oven for another minute or two until melted. While those are in the oven, cook the eggs over easy (or to your desired doneness) in a skillet on medium high heat. 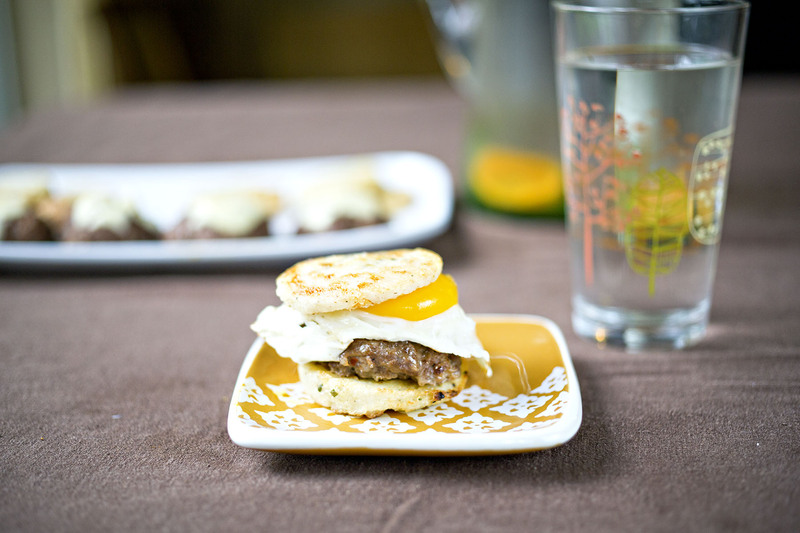 When everything is done, layer an egg with a patty in between the grits "buns" and serve. Non game substitutions: Use you’re favorite breakfast sausage! Vegetarian Substitutions: Egg and cheese without the sausage patty makes a lovely breakfast sammie, especially when you use cheese grits buns!